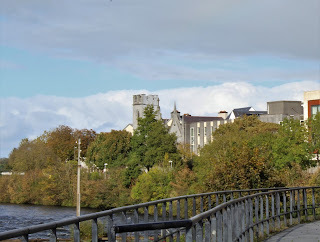 MS' Irish friend said that he would rather spend more time in Galway than the town where he is from, even though when M & I researched, there is a lot of history in his town. YS mentioned that he wanted to go to Galway. 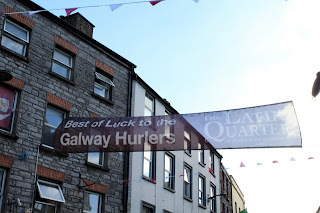 What was the big deal with Galway? 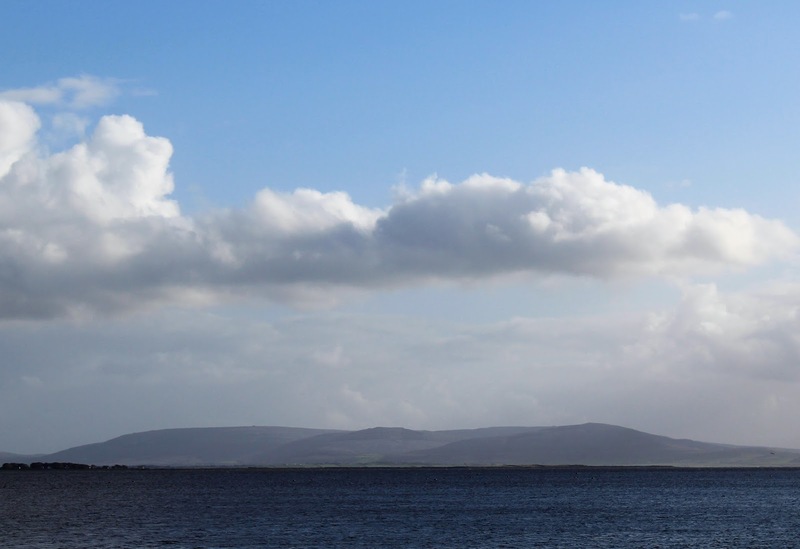 Out of the places we went, the things we saw, and the people we met, Galway (and that area of Ireland) has my heart. The beauty of the rocky landscape, the stone walls that have been there hundreds of years, Galway Bay, and the Gaelic language swept me off my feet. A friend of mine said it sounded like I left a piece of my heart in Ireland, and I certainly feel like I did. After a couple of hours' drive with a driver who made the trip "interesting", we checked into our hotel. At first, the young lady who checked us in seemed a little "stand-offish". She looked Irish: red hair, green eyes, but then she started talking. She was American. After we put our luggage in the room, we went back to the desk to see what we needed to make sure we saw since we had the rest of the day to explore. We found out that Dylan was from San Francisco and went to school in Galway to study ancient languages. M said she thought she was also getting a degree in art, but I honestly don't remember that part. Another employee was at the desk, and she pulled out a map and told us some things to make sure we saw. Joanna was Polish, and when I told her my maiden name we had quite the discussion. I explained that although my maiden name was Polish, I was actually German and explained that my ancestors were from the area of the Czech Republic, Slovakia, and Poland. She asked me if it was Silesia and my face dropped. M said she wished I could have seen my face when she said that. Anyway, Joanna is from that same region, although not the area where my ancestors were from. Enough of that! The first thing we came to during our walk was St. Nicholas Collegiate Church. This church is the largest medievel parish in Ireland. When we walked in, it felt medievel. It was quite chilly and dark, but it certainly was beautiful. 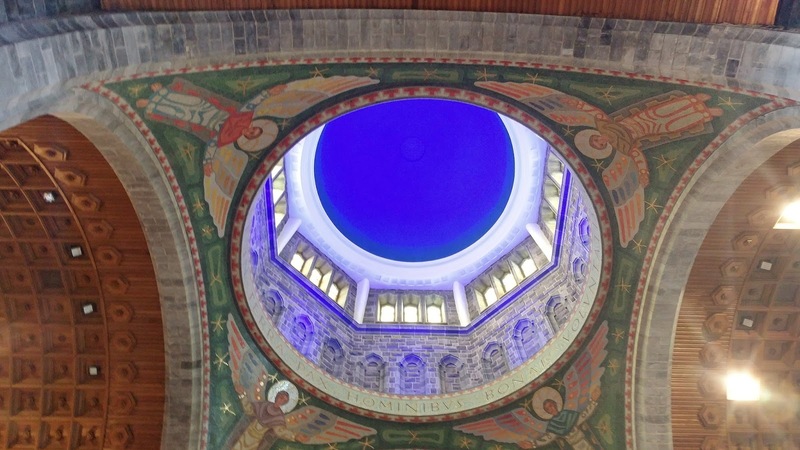 The church was finished by 1320 AD. A timeline of the church. The outside of the church was magnificent. I couldn't get the whole church in 1 picture. I wish I had been able to read the pamphlet as I walked around the church. I think I have the captions correct, but it's very possible I don't. 1 more interesting fact about this church: Christopher Columbus worshipped here. We left there and found a walkway that Joanna told us about. It was a very peaceful, beautiful walk around the water. Even though the Cathedral looks old, it was finished in 1965. Even though it's a "young" church, the details were amazing. This is over the front door. 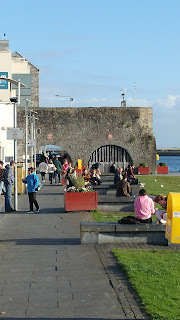 We left the Cathedral and continued our walk...which led us to Galway Bay. But first...another church! This one is St. Mary's, and it faces the Bay. 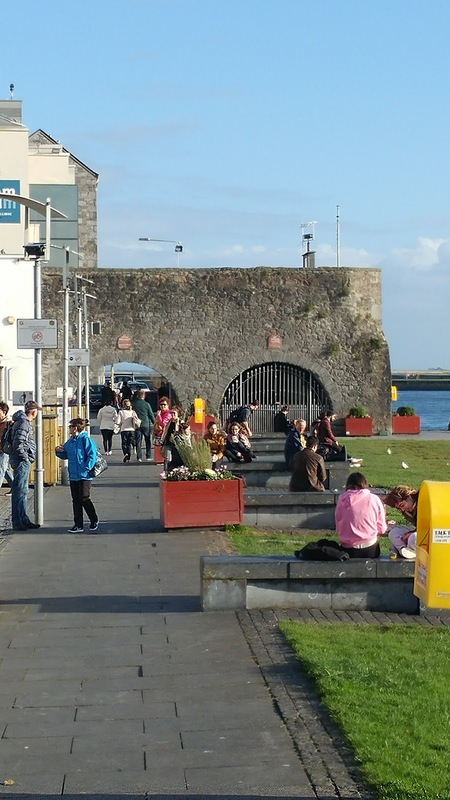 You've heard of the Claddagh? Well, that's where this church is...in the Claddagh region. The Dominicans have been here since the 1200's but I couldn't find exactly when the church was built. If you've seen Ed Sheeran's video for "Galway Girl", at the end he was in one of these blue houses. Galway has a wondeful pedestrian shopping area. We had our first meal here. One morning we walked down the sidewalk to see a bunch of kegs sitting out. I asked the pub worker about it, and he said that they put the empty kegs out the night before (maybe Thursday nights?) and, like the milkman used to do, they are replaced by full ones just in time for the weekend! 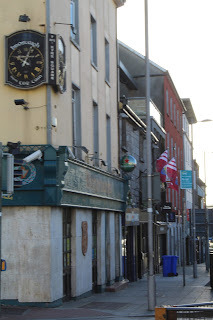 Galway has a big music scene, but we didn't get down to the pub in Salt Hill that Joanna told us about. We did get to see a street band perform. I didn't stay around very long...you never know about pick pockets taking that opportunity! I'm ready to go back, like NOW! Me, too!!! I can have my bags packed in 5 minutes!!! Mary!! Great photos and interesting facts. What a wonderful trip!! OH it was! It was just too short! Looks like a fabulous trip! Definitely still on my must-see list. Fabulous series of photos from your trip. Please feel free to link this up on my not-so-WW today. ;) If I weren't such a chicken of air travel and I had lots of extra cash laying around then I'd love to visit Ireland. What a beautiful place! Thanks for sharing. Have a fototastic day! My dream is a trip to Italy and a trip to Ireland. I would love to go with the kids. AMAZING!! I love the photos you took of all the architecture and the row of homes? Wow! What an interesting connection with the girl at the desk! My family is from the Czech Republic, Slovakia area too. I'm 100% Bohemian. You photos are beautiful. Churches are definitely a favorite of mine. I can't get enough of the bay. Of course I loved the movie P.S. I love you. I am so happy you got to see this. Hopefully I can get to Galway someday.